December 26, 2017 – Smithsburg, Maryland — On October 9th in Lancaster, PA at the 2017 HAP Patient Safety and Quality Symposium, healthcare professionals convened to receive instruction on critical issues facing the industry. 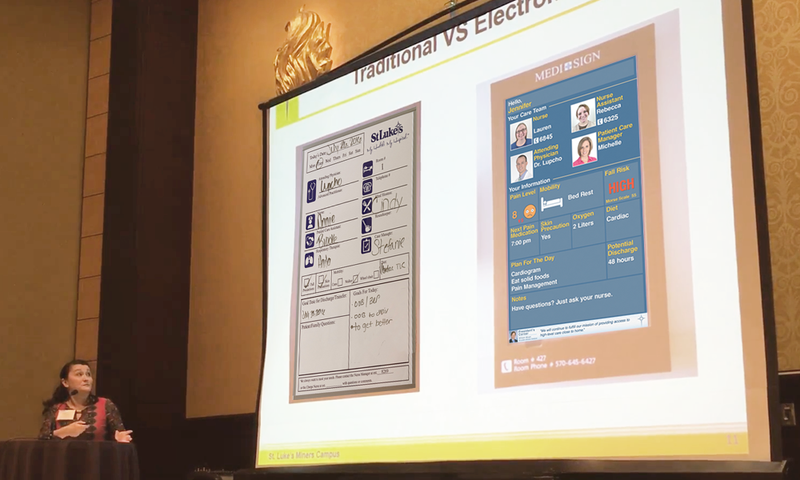 A highlight for the conference was the breakout session on Tuesday entitled “Electronic Whiteboards: Enhancing the Patient Experience” presented by Mrs. Kimberly Sargent, BSN, MSN, NE-BC, St. Luke’s University Health Network. Sargent discussed strategies, tools, and metrics to support the clinician/patient relationship building process and how they affect the HCAHPS scores. She identified the key factor of the electronic whiteboard in the patient room to promote the patient’s perception of clinician care, experience, and communication. She also presented electronic patient room whiteboards as a tool to improve communication among patients, families, and clinicians. In this breakout session, Sargent said that “MEDI+SIGN became our solution to display patient information in an easy and concise way.” She demonstrated how the electronic information flowed when she said that “as soon as the patient is [admitted] from the Emergency Room to the floor, [the whiteboard] information follows them” because the solution is connected to the electronic health record. What was the result? “Nurse and Physician communication scores completely flipped from bad to good after installing electronic patient room whiteboards,” says Sargent. The good news is that “this process is repeatable in other inpatient hospitals,” Sargent says. Sargent reviewed how the study was performed. The data was reviewed retrospectively with eight month’s worth of HCAHPS scores from patients who were discharged from St. Luke’s Hospital – Miners Campus. Post implementation of the electronic whiteboards, the HCAHPS scores were again evaluated over an eight-month timeframe and a side-by-side comparison of the applicable HCAHPS scores in the study categories. “Nurse and Physician communication scores completely flipped from bad to good after installing electronic patient room whiteboards,” says Sargent. MEDI+SIGN® sponsored the HAP Patient Safety and Quality Symposium. As a part of the sponsorship, MEDI+SIGN exhibited, showcasing the MEDI+SIGN communication and patient safety platform. This solution includes the electronic patient room whiteboard, door display, and nurse station display. Additionally, MEDI+SIGN showcased a Stryker S3 smart bed and used it to demonstrate the patent-pending Anti-Fall™ algorithms from MEDI+SIGN. 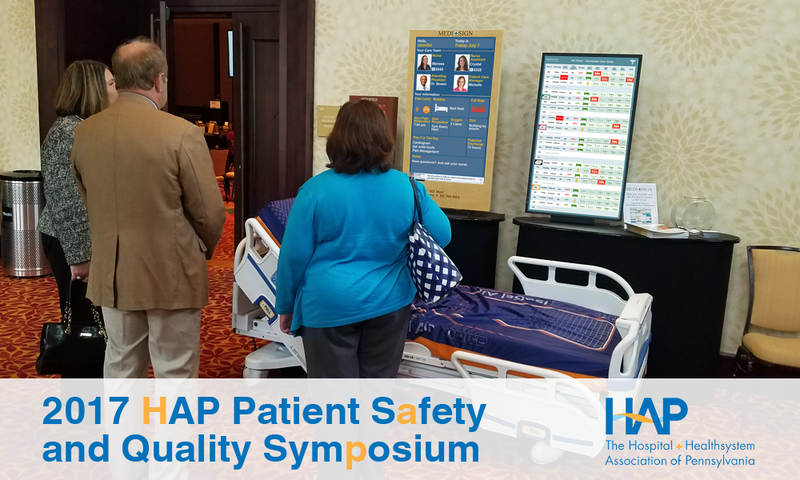 HAP hosted approximately 250 members for two days and featured many ways in which hospitals can improve patient safety and quality. MEDI+SIGN provides hospital and healthcare organizations with a connected health platform that includes patient monitoring and digital whiteboard display solutions. MEDI+SIGN is an integrator of electronic health records and remote monitoring systems to collect and communicate updated and accurate patient health and status information to care teams and patients. MEDI+SIGN was established to leverage its proprietary visual communication technology to improve hospital and healthcare provider’s performance in patient safety and satisfaction, as well as the overall quality and delivery of healthcare.